Notes: The Stour Valley line was authorised under the London & Birmingham Railway & Canals Act of 1846. The increased threat of the new railway lines had made the canal owners wish to have a say in the construction and ownership of the fledgling rail network. On 18 July 1846 the London & Birmingham Railway (L&B), Grand Junction Railway (GJR) and Manchester and Birmingham Railway (MBR) merged to form the London & North Western Railway (LNWR). 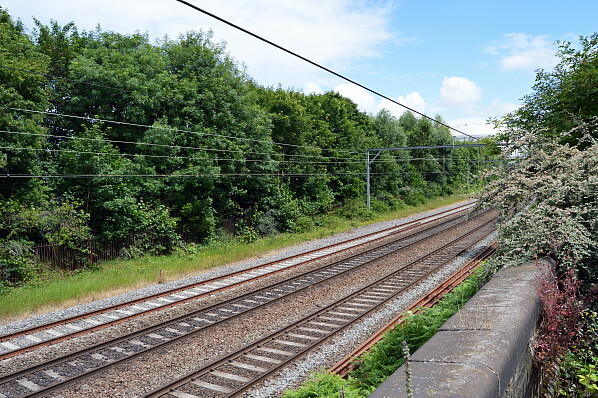 It would be this newly formed company which would go on to construct the Stour Valley line ensuring a more direct connection between the cities of Birmingham and Wolverhampton. Construction started in 1848 and the line was completed on 21 November 1851, with goods trains running from 1 February 1852. Passenger services began between Birmingham New Street and Wolverhampton on 1 July 1852 from a temporary platform at New Street, as the station was still under construction and would not be fully operational until 1 June 1854. The first station to open at Monument Lane would initially appear in the Bradshaw from May 1853 to July 1854 with the name of Edgbaston, but with no trains shown as calling. In reality there were many trains which called there, with the station serving as a ‘ticket platform‘ for all Birmingham-bound trains. This was because Birmingham New Street was an ‘open‘ station as Queens Drive, a public right of way, ran through the centre of the station and no ticket barriers were in operation. The station started to appear in the LNWR company timetables from July 1854, still called Edgbaston, but during August and September 1854 Bradshaw listed it as Monument Lane with only southbound (Birmingham direction) services calling. From October 1854 Bradshaw shows the same southbound-only service but lists the station as Edgbaston once more. By November 1854 Bradshaw shows the station as having a service both to and from Wolverhampton and the name remains Edgbaston. The LNWR manager’s circular of 22 January 1874 shows that from 1 February 1874 the station name would revert to Monument Lane. During the early 1880s plans were drawn up for the enlargement of the Monument Lane Coal Wharf to enable transhipment between the railway and the nearby Birmingham Canal. The station was in the centre of this development, and the LNWR drew up plans to construct a new Monument Lane 10 chains (220yd / 200m) north of the original site. The original station would close during 1886 with the new station opening at the same time. The site today has little to show that a station once stood here. 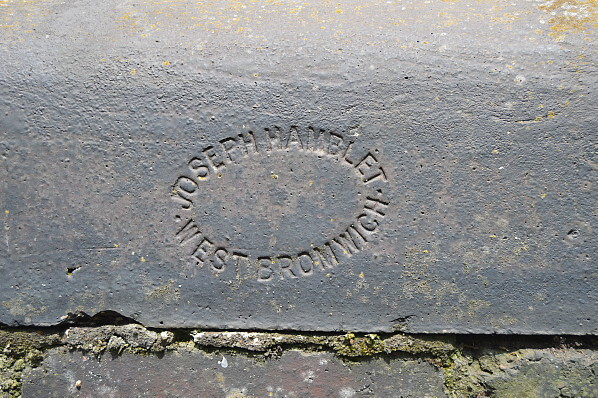 A section of wall in blue brick can be found approximately where the station stood, and many of the coping stones atop the wall are embossed with the name of Joseph Hamblet of West Bromwich, a firm which was manufacturing bricks from the time of the construction of the station until after World War 1. Being the direct route between Birmingham New Street and Wolverhampton, the Stour Valley line is still busy with trains. 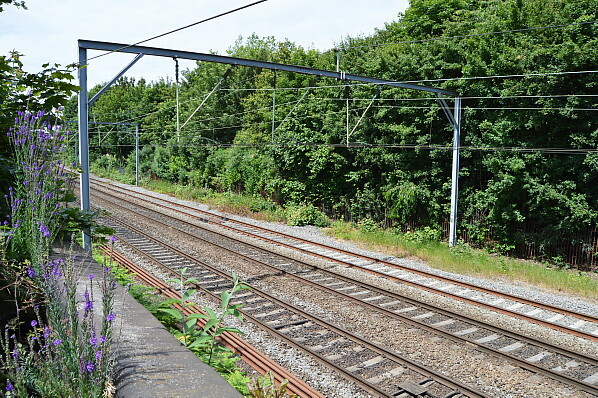 Looking towards Birmingham from the approximate site of the station on 29 June 2014. Looking in the Wolverhampton direction from the approximate station site. Locally made blue brick coping stones embossed with the manuafacturers name. It is unclear if the brickwork was associated with the original station although the company was producing bricks at the time the station was built.